With the Samsung Galaxy S7 & Edge, one can do more than making a call or sending a text. Now, with the new technology and with the blessings of app developers, we can remotely access the desktop computer or laptop from our Samsung Galaxy S7 or Galaxy S7 Edge to perform certain tasks. With these Remote Computer apps, we can have the access to all our files and documents that are stored at the distant computers or laptops. Of course you will need an active internet connection on both devices in order to connect with remote desktop apps. For this purpose, I have brought about the list of the few best Galaxy S7 Remote Desktop PC Apps, which can help you to remotely work on the Desktop computers. Here is the app topping our list. Remote Desktop Client is one of the most powerful and the best application of the Play Store that lets you to connect to your PC without losing access to your files and documents. With the help of the online internet system, this app enables you to have the array of features including the RemoteFX Graphics support, VNC protocol support, Microphone support, Pinch to zoom and many others that make your connecting process smooth and easy. Another great option to control your PC remotely is Unified Remote that supports a number of features for your fine access. The application is preloaded with more than 90 programs like mouse, keyboard, music players, and many more. This one is the fantastic tool for those people who want to have the remote control of their PC either for watching TV or for having the access to their files and documents. The app is fully loaded with the number of features that you can have only by trying this app on your Galaxy S7. If for some reason, you are looking for an alternate to remote your PC, then Remotix VNC RDP Desktop is the perfect application for you. this application allows the users to get the access to their PCs directly from their Galaxy S7 via VNC and RDP. The application comes with the amazingly fine User Interface that works fast and flawlessly. This app is helpful for the persons who want to connect to any computer anywhere in the world. Another best application to get the fastest, easiest and the securest access to Windows or Mac is Splashtop 2 Remote Desktop App. This app is designed in order to help you with each and everything you want from your PC. The Splashtop app provides the HD resolution display, access to multimedia files, games and more on your computer. Along with this, the app also helps you to check on the people, places, and things with the live streaming of videos. Here’s another application that is tailored for the same functions as all of the above but what makes this app distinct from all the other apps is its unique features. This app, besides providing its users to access their remote computers, serves to run the programs on the host computer, change settings, reboot the computer and many other similar functions. The app comes with the great interface that is user friendly. 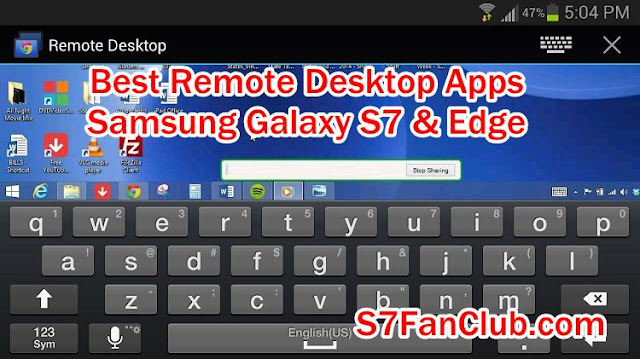 If you have got another favorite PC Remote Desktop App for Galaxy S7, then do share with us in the comments section.